Comedian Marc Maron (see interview, 6/9/09), now riding high with his “WTF” podcast, and reaping some of the long-sought after acclaim that had eluded him, on August 9 released his first full stand-up album since the podcast began, “This Has to Be Funny .” The album may be the first exposure to his stand-up that those who have found him solely through the podcast are getting, and it proves to be a good introduction to Maron’s style and subject matter. “This Has To Be Funny” was recorded in a series of shows in Maron’s former New York home turf, specifically Union Hall in Brooklyn. Maron thrives on anger at the unexpected, having moved away from the political broadcasting he once did on Air America Radio. He plays with this in the pieces “New York Hipsters,” “Cat Guy” and “ ‘I Didn’t Know How To Love You.’ ” Maron’s world finds him wondering why he’s talking to himself, marveling at his own fondness for his housecats, and despairing at hearing things from his parents that he never wanted to know about. A highlight of the album is its longest piece, “The Creation Museum,” where Maron gives something like a journalist’s account of the Midwestern museum that aims to convince visitors that man and dinosaurs could have co-existed at the same time, contrary to science and evolution. Maron sounds like a political and angrier Woody Allen as he tells the story, setting his sights on the depiction of biblical figures as well as the dinosaurs in the dioramas. As the museum works Maron into a righteous froth, you hear the audience responding, because this piece is a creative concept realized. It’s also something no other comic is likely to have come up with, because it’s a perfect meld of Maron’s political point of view with his observation, writing skills and performing style. For that alone, “This Has To Be Funny” is worth checking out. 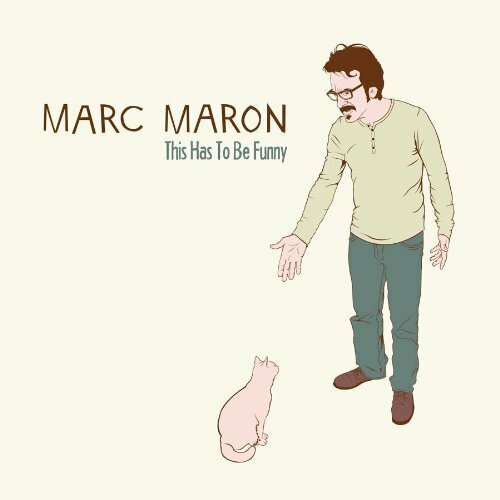 It’s not as sprawling as his last pre-WTF album, the double-disc, or double-length “Final Engagement.” That’s flipsides of a coin – if you’re a fan you’ll want more from “This Has To Be Funny,” but if you’re new to Maron or a casual listener, Maron’s latest is more concise and focused, with less riffing about his own circumstances or the nature of the performance itself. For this album, every piece is fully conceived and realized.